In 1880, the first train arrived in Asheville and the railroad age reached western North Carolina. 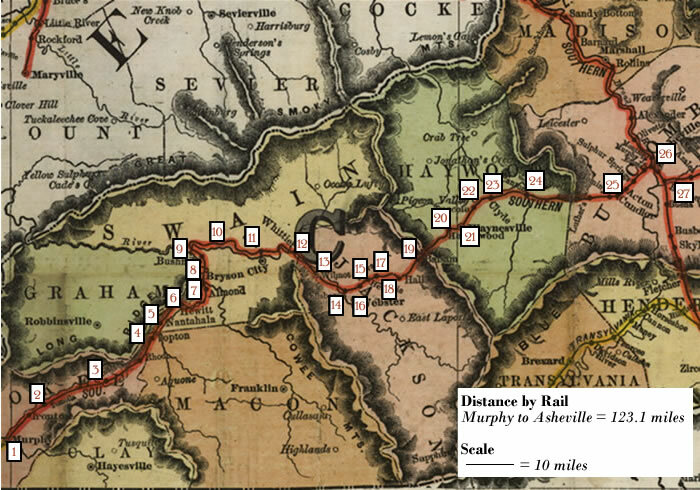 In 1894, the Murphy Branch of the Southern Railway was built, connecting Asheville to the far western part of the state and somewhat offsetting the lack of improved roads that still prevailed in many communities. Taking the Train is the second geographically based timeline that focuses on life in the region. This timeline covers the period from 1905 to 1919. The text for each railway stop along the Murphy Branch is quoted from the 1912 travel guide The Western North Carolina Section at a Glance (issued by the Passenger Traffic Department, Southern Railway, Premier Carrier of the South, Washington, D.C., 1912). Want to travel more? Follow wagon trails through western North Carolina in the 1890s. Map excerpted from Railroad map of North Carolina, 1900, examined and authorized by the North Carolina corporation commission. Courtesy of Library of Congress Geography and Map Division.